Music Reference Collection Series, no. 60. Westport, Conn. and London: Greenwood Press, 1997. Cloth, 6.5 x 9.5 in., 423 pp. This type of reference is long overdue. The Rolling Stones and the Beatles each generated bibliographies within a decade of their formation, surely the Dead deserved one within a short while after their formal inception, thirty-three years ago. But none has been forthcoming, and with every passing year, the amount of ink devoted to them has grown to mountainous proportions. David Dodd (the webmaster of a popular site exploring the literary antecedents and allusions woven into the lyrics of Robert Hunter and other Dead lyricists) and Robert Wiener, two research librarians, Deadheads both, have spent an enormous amount of time on what is clearly a labor of love, and have made an excellent start on this immense undertaking. Deadheads will be delighted with the results. The book provides an overview of nearly 3,000 articles, reviews, books, magazines, chapters and unpublished treatises devoted to the band, its music, its members, and the scene surrounding them written over the last 32 years. Its strengths are its extensiveness and its annotations: it is especially good on album reviews, fan magazines, and academic papers - the level of detail and scope is impressive. The authors are professional librarians, so it is no surprise that the book conforms generally to academic standards. Beautifully cross-referenced, it has four separate indices for Authors and Composers, Artists and Photographers, and Books and Periodicals, as well as a subject index. Likewise, the annotations are good, though their inconsistency may irritate readers. Occasionally, they are extensive - reviews are usually summarized as positive or negative, and interviews frequently include the topics covered. But the authors point out that not every item passed their scrutiny, which is ironically one of their best contributions: noting which items they did not examine themselves. This marks the work a first attempt, but it also makes me wish they had done a better job of presenting the book as an ongoing effort, and solicited clippings, citations, and corrections from their readers. Good prefaces by both authors explain their system and policies, so my criticisms are ones of philosophy, not oversight. By their own admission, they included only a few newspapers - the San Francisco Chronicle and Examiner, and the New York Times, with a smattering of entrants from other papers. The authors deserve commendation and credit for combing the Underground Newspaper Collection and the Alternative Periodical Index , valuable sources still widely ignored. Omitting other newspapers means no list of tour reviews, a gaping oversight with a touring band. But as the authors state, such a project was far beyond their scope. A more serious criticism has to do with editorial inconsistency: numerous duplications were only culled at the last minute, resulting in a number of holes. On the one hand, we may applaud the diligence this represents; on the other, it smacks of a rushed deadline, which isn't appropriate for a reference work, whose publication shouldn't be timely so much as merited. Perhaps this explains the most serious charge one can level at the book: the attributions and citations for so many incomplete entries could have been filled by any researcher with access to a major library - no volume number, date or proper title for a mid-seventies Rolling Stone article? Bibliographers and academics will find much to cavil with, then. But quibbles aside, it fulfills the most important criteria of a bibliography: it should make possible more research on the band. 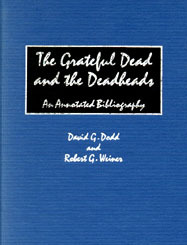 It is unquestionably an important contribution to the scene, and an indispensable addition to every Deadhead's bookshelf. recently released by an imprint of Holt.